Updated 10/30/18: Shareholders of Aquila Tax-Free Trust of Arizona are cordially invited to attend their Annual Shareholder Meeting on Wednesday, October 31, 2018 at 9:30 a.m. at the J.W. Marriott Scottsdale Camelback Inn Resort & Spa, Salons C-E, 5402 E. Lincoln Drive in Scottsdale, Arizona. Breakfast will be served prior to the meeting. Those unable to attend the Scottsdale meeting may be interested in attending a special informational outreach meeting in Tucson at 10:00 a.m. on Tuesday, October 30, 2018. That meeting will take place at the Westin La Paloma, Aster Room, 3800 E. Sunrise Drive. A light breakfast will be served prior to the outreach meeting. Attendees at both meetings will have the opportunity to visit with Fund Executives, Trustees and the Portfolio Managers. Special guest speaker at the shareholder meeting in Scottsdale will be Arizona Deputy State Treasurer Mark Swenson. Mr. Swenson has held senior executive positions for elected officials in state government for 24 years including four State Treasurers, three Senate Presidents, and five Senate Majority Leaders. Prior to the Treasurer’s office, he served for more than 12 years as a Senior Policy Advisor at the Arizona State Senate, including four years in budget and tax policy. The Phoenix Business Journal, on October 29, 2018, published market observations from Aquila Tax-Free Trust of Arizona portfolio manager, Tony Tanner: My View, Arizona continues to benefit from municipal bonds. In the opinion piece, Mr. Tanner discussed the ability of investors in Arizona municipal bonds to support and participate in their local and state economies, and in visible and successful public works projects which have been funded primarily through municipal bonds. 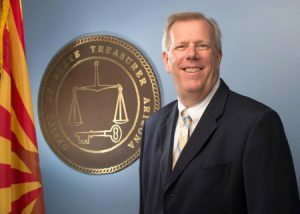 “When Arizona investors consider the high quality and demonstrated strength of the Arizona municipal bond market, these characteristics can provide them with added confidence in making municipal bond investments that are essential to furthering the economy and quality of life in Arizona”, Mr. Tanner said. Please plan to attend a meeting. We look forward to seeing you in either Scottsdale or Tucson.